Most iPhone users may face a same problem and that is transferring data. They wonder how to transfer pictures from computer to iPhone effortlessly. So, are you unaware of it or you have failed to do it? Don’t worry we are here to help. In this article, we have made a list of the most efficient and effective options that you can go for. When you are looking for how to send pictures from computer to iPhone, you will come across two basic options, one of them is to transfer pictures from PC to iPhone with iTunes and without iTunes. 1. So, connect your iPhone X/8/8 Plus/7/6/6s/5/SE to your computer with a USB cable. 2. iTunes will be launched automatically. 3. Now, on the iTunes panel, select your device and go for the Photos tab on the bottom. 4. Tap “Sync Photos” and choose the folder where you kept your photos previously. Photos will start transferring immediately. As you can see, transferring photos with iTunes is easy, but note that once you transfer photos with iTunes to your iPhone, all the existing photos on your phone will be deleted. 1. So, to begin with, you have to download and install the free version of Tenorshare iCareFone on your computer. 2. Launch the app on our computer and then connect the iPhone to the computer with a USB cable. 3. Wait a few seconds for your computer to detect the iPhone then go to “Manage” on the top menu. 4. Now, all transferrable file types will be listed on the left panel. 5. Select “Photos” from the list and click on the “Import” option and then choose the photos you want to transfer. 6. Lastly, select “Open” on the pop-up message and the files will start transferring immediately. 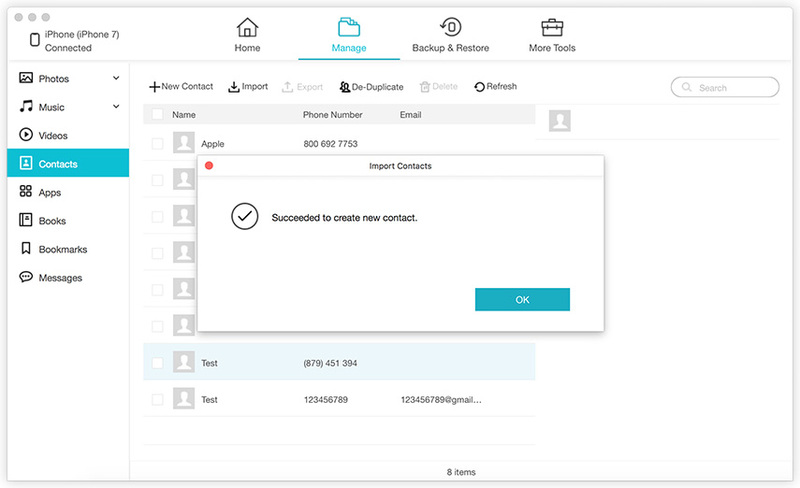 Many users think that Apple certified apps are the best in terms of usage and effectiveness, but as you can see here Tenorshare iCareFone is an excellent app and it is certainly capable of transferring your files from one device to another without any fuss. Also if you are looking for how to copy pictures from PC to iPhone, then you should definitely use this app, as Tenorshare iCareFone supports both Windows PC and Mac. 1. Launch the AirDrop app on your Mac and turn on visibility to “Everyone”. You can easily find AirDrop from Finder. 2. Now, turn on the same app on your iPhone. 3. Then make your iPhone visible from the AirDrop panel. Tap “Everyone”. 4. Now, go to your Mac, and search for the iPhone. 5. When it is found, connect it with your Mac via AirDrop. 6. Now, drag and drop the photos you want to send on the recipient panel of AirDrop. 7. Finally, click “Send” and “Accept” on your iPhone. AirDrop uses a very simple method to transfer your files wirelessly. Keep your target devices connected to the same Wi-Fi network and also keep your devices within a certain range for the app to work. Also, this app is not suitable for transferring large files. 1. Install the Dropbox software on your computer. 2. Run the app and sign-in to your Dropbox account. 3. Open Windows Explorer, and you will see the Dropbox folder now. Now, choose the photos or the entire picture folder and just drag and drop it inside it. 4. Once it’s done, go to your iPhone and install Dropbox app. 5. Log-in to the same Dropbox account from your iPhone and tap on Photos. 6. Find the photos you just added and long press on the photos. An option will appear to Save to Camera Roll. Basically, Dropbox provides a very simple service that is very useful for transferring or rather synching data. But keep in mind; you only get 2 GB of free storage initially while signing up. As you know that there are a lot of apps on the market for data transfer but the 4 methods mentioned in this article are suitable for any user who is looking to transfer from computer to iPhone. Although, we are a little light on the topic of iTunes still it is a viable way to transfer your pictures. Dropbox and AirDrop apps are also preferred by a lot of users and they are equally effective when it comes to data transfer. But the simplicity and efficiency provided by Tenorshare iCareFone are the best. Also, it doesn’t have any storage limitations or Wi-Fi connectivity issues or any type of major disadvantages like the others here and that’s why it is our winner and we highly recommend it!